We serve dozens of clients from different industries, and for us there are no secrets in accounting and taxes. Our employees have extensive experience that they apply effectively in dealing with our customers. In our contracts liability is limited for any errors in our fault. This cannot be agreed with any Chief Accountant on a labour contract. We do everything necessary to protect the rights of our clients with the tax authorities, the insurance institute and other local institutions, always delivering optimal solutions and results. Our prices are significantly lower than the cost of your accountants, their computers and software, supplies, subscriptions and trainings. We offer exceptional flexibility and speed in our work, and unlike employees hired on labour contracts, we do not go on vacation or on sick leave. 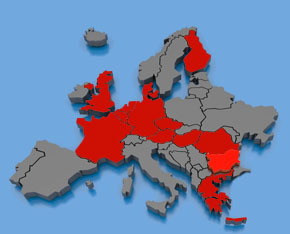 We provide excellent service to clients from 13 EU countries - Denmark, Holland, Finland, Germany, Austria, Belgium, Great Britain, France, Hungary, Czech Republic, Poland, Greece and Romania.